The Mint & Aleppo Pepper Chicken Kebabs from Saveur No. 157 drew me in, mainly because I’m a big fan of Aleppo pepper. And because Saveur is my favorite cooking magazine. And because this is the grilling issue, which may be my favorite way to cook. So, favorite mag, favorite cooking style, and favorite ingredient…. pretty easy to see why I made and video’ed the recipe with minor modifications. Then I turned the page, to find a second kebab recipe with lamb and pistachios. The most underrated meat (the other, other red meat), and the best nut (that second part isn’t open to debate). So the lamb kebabs were a must make recipe as well. I’ve always enjoyed the Kefta (or Kofta) style kebabs because you can get so much more flavor into the kebab by mixing the spices into the ground meat than by just marinating or coating the meat in chunks. 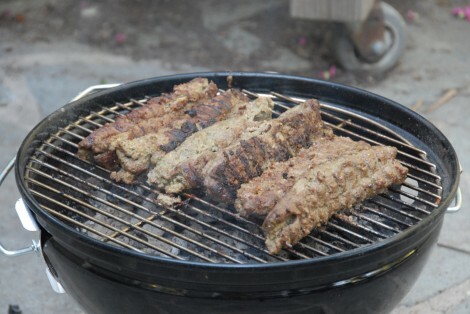 Also, when grilling kebabs, large chunks of lamb will often end up tough, while the ground meat stays more tender. If you watch the video, you will see that I had some difficulty keeping the meat on the skewers that time. I think I have identified the problem, which is that I didn’t drain the Bulgar wheat well enough. I had the camera rolling in the background, and just did a quick dump and finger drain. In the recipe below, I’ve made a couple of changes and edits to help with this – although I also think that these could be grilled without a skewer at all and be just as good. Just form them into little kebab shaped loaves, and grill them. In terms of modifications from the Saveur recipe, I reduced the heat and altered the proportions a bit. While I love spicy foods, my 6 year old and 2 year old aren’t as fond of them. As it turns out, my 6 year old ate more than two of these kebabs with yogurt sauce, and would have finished off more if I hadn’t made him eat some vegetables as well. Finally, you will see in the video that I grilled these on the Weber Smokey Joe that I recently reviewed. Put the pistachios along with 1/2 cup of water in your food processing device of choice. Process or blend until smooth, adding water by the tablespoon if required to produce a smooth, loose mixture. Add the rest of the ingredients and process, pulsing and scraping down the sides as needed to produce a reasonably smooth mixture. Ingredients should be individually recognizable, but in miniscule pieces. Place ground lamb in a large bowl, and add the processed vegetable/herb mixture. Mix well, but quickly – don’t overwork the meat, or let it warm up much. If you choose to use skewers, form the kebabs on the skewers by placing a handful of meat around the skewer, and then stretching it and forming it into a uniform log shape, roughly 6″ (13 cm) long and a little less than 2″ (5 cm) in diameter. About like a medium-large banana, but straight. 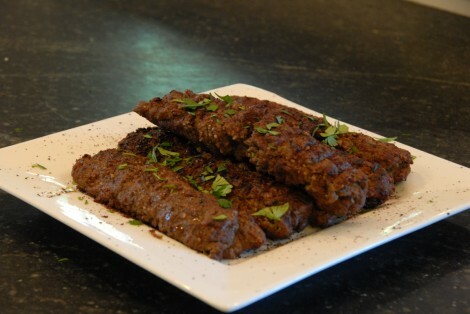 Add ridges to the kebabs by pressing in with your fingers, either while forming or after resting the kebab on a sheet pan. If you form them on the pan, the 4th side can be shaped after you start grilling, assuming that you start grilling on a side that’s already been shaped. This recipe should make about 10 kebabs. If you choose to skip the skewers, you still want a 6 x 1 1/2 ” loaf of meat, squared off on the sides. Indent the loaves as described above, leaving the last side to shape on the grill. Allow the meat to chill and rest in the refrigerator, un-covered, for at least an hour. Grill over a hot fire by placing the kebabs / loaves on the grid – don’t touch them until that side is done, and then carefully turn them to another side. It should be about 4 minutes per side. If after 4 minutes your kebabs haven’t loosened up from the grill, or aren’t seared, the fire isn’t hot enough. Total cooking time should be around 15 minutes. 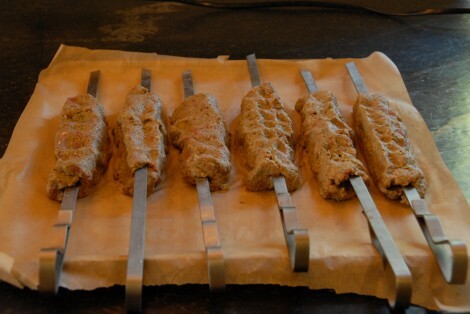 Remove the kebabs from the grill and skewers, plate them, and then drizzle with olive oil and dust with sumac. If you don’t have any sumac, lemon juice and maybe some lemon zest would be a decent alternative.